I have no idea what I just watched, but I love it. David Dockery, of Ireland, posted a video to Facebook Wednesday of him drumming through the "Pepe Silvia" scene from the "Sweet Dee Has a Heart Attack" episode of "It's Always Sunny in Philadelphia." The video has been viewed more than 2 million times and shared by more than 25,000 people as of Sunday morning. In the scene, which has been used for an endless amount of memes, Charlie explains an elaborate conspiracy to Mac about their jobs in an office's mailroom. 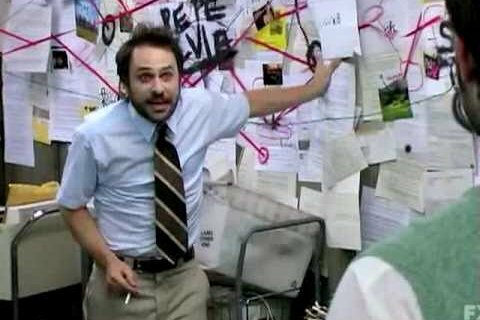 The conspiracy, of course, is the work of Charlie's imagination, and the scene ends with Mac finding out they've both lost their jobs. Dockery, who also posted the video to YouTube, drums through the scene. I write that he "drums through the scene" because, well, that's literally what he does and there's really no other way to summarize it. Watch below as Dockery captures the rhythm of the Charlie's rant, even knocking on one of his drums when Charlie knocks on the wall and screams "CAROL!" Dockery describes himself as a "really cool f****n dude" on his Facebook profile. This video is very cool, so we agree.